At Cambridge we offer a variety of Spanish language experiences - from exposure several times per week to daily immersion in both English and in Spanish. Your child is born with the ability to communicate and learn many different languages. Research consistently shows the benefit given to children who are exposure to a second language and the specific ways in which the second language learning positively impacts a child's learning potential. Children who learn a second language in settings where they are able to attain vocabulary using both languages simultaneously helps further comprehension in both languages and has benefits across multiple learning domains. Bilingual children are better able to focus their attention on relevant information and ignore distractions. Executive functioning, used for planning, judgment, working memory, problem-solving, and staying focused on what’s relevant is stronger in bilinguals. During speech, both languages are active, and the brain has to work to suppress one language while the other is being used. Bilingual children in dual-immersion schools have been shown to score higher on both verbal and math standardized tests conducted in English and also display stronger logic skills. Bilinguals have increased mental flexibility and creativity. When a child learns that there is more than one word for an object, it stretches her mind in new ways, producing greater mental flexibility and creativity by creating two windows through which the world can be viewed. Lev Vygotsky stated that “bilingualism frees the mind from the prison of concrete language and phenomena." The brain's effects of aging are diminished in bilingual adults. Understanding another language may decrease the incidence of Alzheimer's disease in later years. How does the brain learn language? What is importance of the mother tongue? Language development starts before birth when the child hears his first sounds and associated emotions from his mother. From that moment onward, the child uses this language to express his thoughts and feelings. Successful attainment of language greatly impacts his ability to read later in life. Understanding the environment, the relationship with others, and the development of thoughts as well as concepts at a later age, all happen through the first language: the native language or the ‘mother tongue.' The mother tongue is an essential instrument. During identity development, the mother tongue assists a child in developing his relationship with his parents, family members, extended family, and friends as well as with his own past, future, and own culture. The mother tongue also provides a foundation for managing other languages. Learning a second language happens through the mother tongue. When do children begin to learn a second language at Cambridge? Parents want to know HOW we introduce a second language to their children, and the answer is simple - the same way a child learned her mother tongue. A visitor to our school will not find a group of students conjugating verbs or memorizing dialogues. Our teachers understand that the more interesting and interactive the conversations are, the more language the child will learn. Reading books, singing, playing word games, and simply interacting with children around a common interest builds vocabulary and comprehension while providing increased opportunities to develop listening skills. Children learn by engaging in daily interactions and experiences that involve rich vocabulary and exciting activities. By the age of 5, many children enter kindergarten programs, making language competency vital for navigating and participating in the elementary classroom community. Our creative ways to encourage the use and implementation of both languages will result in dual-language proficiency and fluency. Language is the vehicle for instruction in all our classrooms across all learning domains. No matter how much second-language exposure you decide is right for your child, we will help ensure that he or she meets his or her learning and developmental goals equally in both languages. What if my child doesn't seem to want to learn a second language? At Cambridge, learning is always fun, challenging, and rewarding. Teachers of young children understand that children communicate their knowledge using the safest method possible. This may mean the use of the language spoken at home, the second language, or a mixture of both. We recognize that there will be children who are more interested in speaking and learning in their mother tongue - however, this does not mean they are not learning the second language. Children enjoy listening, aquiring knowlege and often show their abilities when they feel confident in the growth process. Children who do not yet communicate in the second language are always learning and display their compentency when they feel safe to do so and when the feel comfortable. Most of the time allowing a reluctant participant a bit of time to feel self-confident results in full engagement. We also know that children are easily persuaded when the learning experience is unforgettable, meets them where they "are" developmentally, and provides them with a feeling of personal accomplishment. As with all of our learning experiences, we focus on the individual child's developmental needs first and create provocations and experiences to help promote the acquisition of the second language. 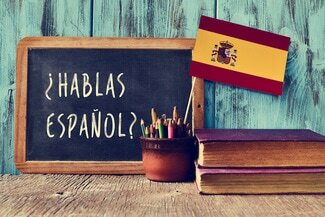 We often find that once an English-speaking child is easily conversant in his mother tongue and has attained sufficient vocabulary in Spanish, Spanish is spoken more readily and openly and with more confidence. Our biggest goal and responsibility is to help your child learn, love to learn, and succeed as a learner of all things, not just language.